Toronto – November 3, 2014 – Forty years ago, the Canadian and Mexican governments came together to create the Seasonal Agricultural Workers Program (SAWP). At the time, the SAWP was seen as the perfect answer to an agricultural labour shortage in Canada and poverty and rural unemployment in Mexico. 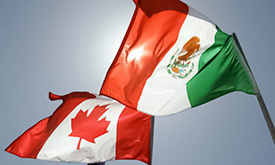 The Memorandum of Understanding signed by both countries mentioned the close bonds of friendship, understanding, and cooperation between Canada and Mexico as the foundation of the SAWP. It also promised to provide Mexican SAWP workers with "adequate accommodation, remuneration, and fair and equitable treatment while (working) in Canada." Forty years later, and decades after researchers detected huge deficiencies in the program, both countries have failed to fulfill their commitment to respect SAWP workers’ fundamental human and labour rights. Despite documented public evidence of recurrent violations in the program, the Canadian government still relies on employers' "good faith" and refuses to acknowledge its responsibility to protect SAWP workers. There are also several human rights claims now filed that the Mexican government works with employers to enforce illegal hiring practices that discriminate against women, while pairing mostly male migrant workers with employers who have records of abuse and mistreatment. Furthermore, Canadian authorities idly stood by when the Mexican government blacklisted SAWP workers who chose to defend their human and labour rights. As a result of these injustices, UFCW Canada and the Agriculture Workers Alliance have worked to provide much-needed legal, translation, support, and guidance services to migrant farm workers across Canada for over ten years. We have challenged discriminatory legislation in Alberta, British Columbia, Ontario and Quebec, and have fostered meaningful discussions on the fundamental labour and human rights of agriculture workers. Every year, more than 18,000 Mexican farm workers come to Canada under the SAWP. And yet, despite the program's worldwide renown, workers enrolled in the SAWP routinely face discrimination and violence and lack adequate legislative protections. That is why UFCW Canada, the AWA, and our allies will continue to defend migrant farm workers' rights, and demand that the SAWP be reformed so that seasonal agriculture workers are respected on the job and in the communities in which they work.